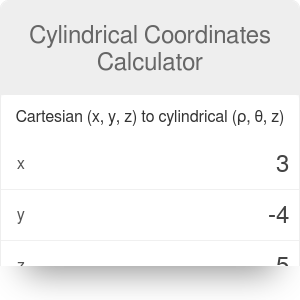 This cylindrical coordinates calculator will allow you to convert Cartesian to cylindrical coordinates, as well as the other way around. It is a more complex version of the polar coordinates calculator that allows you to analyze an arbitrary point in a 3D space. Coordinates are used to describe the position of any point in space. When given the set of three coordinates, you can uniquely define a point located in a three-dimensional space. The Cartesian coordinate system is created by choosing three lines, all perpendicular to each other, and crossing a common point known as the origin. These lines are called the x-axis, y-axis and z-axis. Each pair of axes defines a plane. The coordinates of any arbitrary point are defined as the distance between that point and each of the planes. The cylindrical coordinate system is an extension of the polar system in three dimensions. It means that the system, just like the polar one, has a pole - a central point (most often overlapping with the origin of the Cartesian system) and a polar axis - a ray that starts in the pole as in located on the CY plane (that is, at a level where z = 0). Additionally, the z-axis is used to describe the position of the point. In the cylindrical system, every point has three coordinates (ρ, θ, z). First, you have to project the analyzed point to the XY plane. Then, draw line between this projected point and the pole.ρ is the distance between the pole and the projected point, measured on the XY plane only. θ is the angle created by the line you drew and the polar axis. The third coordinate, z, is the vertical distance between the original point and the projected point. You can, of course, use the cylindrical coordinates calculator to find the polar coordinates in a 2D space. Then, the z-coordinate will be always equal to 0. 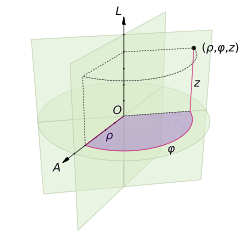 (ρ, θ, z₂) are the cylindrical coordinates. Cylindrical Coordinates Calculator can be embedded on your website to enrich the content you wrote and make it easier for your visitors to understand your message.